Dean of Agriculture: The University of Hawaii at Manoa was founded 100 years ago as the College of Mechanical and Agricultural Arts, mainly agricultural. So it is that CTAHR -- UH's College of Tropical Agriculture and Human Resources -- also celebrated its centennial Thursday with an awards dinner. The evening's main award went to Dean Okimoto, owner of Nalo Farms, head of the Hawaii Farm Bureau and the state's only celebrity farmer. He was honored island style: His friends said mean things about him from the podium. The emcee, Derek Kurisu of the Big Island KTA Stores, showed a slide of Okimoto in the fields at Nalo Farms: "This may be the only time Dean's ever really been on the farm. He's usually drinking at Side Street Inn." Roy Yamaguchi, on video, wondered why Okimoto was always in the company of beautiful women: "What do they see in you, Dean? You've got a face only a mother could love." Okimoto's high school classmate, Mufi Hannemann, Iolani '72, told tales about his school days. ("All bogus," said Okimoto.) Then the mayor dragged the farmer on stage for a karaoke duet. Okimoto is notorious for showing up everywhere in shorts. Dinner at his friend Alan Wong's (whose namesake was in the audience). Lobbying at the Legislature. "He's the only one who gets away with that," said Rep. Jerry Chang. 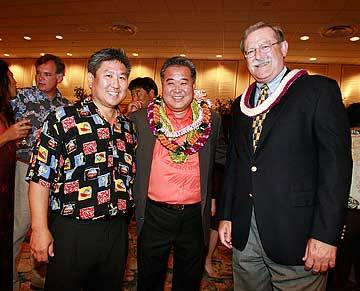 At the awards banquet, Okimoto was so well dressed many didn't recognize him. "I asked them, 'Do I really have to wear long pants?' " said Okimoto. "They said, 'Yes, but to make up for it, you can wear a sport coat.' "
Still Open: This town is Rumor Central. The latest, related to me by people who you'd think would know better, is that now that's there's a new Ruth's Chris in Waikiki, the one in Restaurant Row is closing. Called Randy Schoch, who owns both restaurants. "That's the most preposterous rumor I've heard since the one that I was gay," said Schoch, who has a wife and kids. "There's no way we'd close Restaurant Row. I love that little store. We did $6.5 million there last year." Rested: Get-rich guru Robert Kiyosaki ("Rich Dad, Poor Dad") was back in Honolulu last week, celebrating his 60th birthday. Kiyosaki now has 18 books, a TV show, a column on Yahoo.com and a $195 board game named Ca$hflow. His new book, "Why We Want You To Be Rich," was co-authored with his buddy on the lecture circuit, Donald Trump. "I still get beat up by the press all the time," says Kiyosaki. The Wall Street Journal panned the book he wrote with Trump in a review titled "Rich Guys, Poor Advice." In Hawaii, Kiyosaki did some promo work -- a live in-studio chat on John Noland's K108 show, a book signing at Barnes & Noble. But little else. "Hawaii's where I catch up on my sleep," he admits. "I start yawning the minute I get off the plane." Souvenir: When most people vacation, they bring back a few tchotchkes as souvenirs. Promoter Andrew Meader brought back an off-Broadway musical. Last summer in New York, Meader and wife Arlette caught an award-winning show called "Altar Boyz," about a Christian boy band: Matthew, Mark, Luke and Juan. "It's pee-in-your-pants funny," says Meader. Normally a hit New York show wouldn't include Honolulu in its first tour, but Meader knew the company manager, former Hawaii resident Ryan Lympus, who studied theater management at Hawaii Pacific University. "Altar Boyz" opens Wednesday at the Hawaii Theatre. Free Cone Day: "It's hard to eat ice cream and be in a bad mood," says Ronni Tai See, owner of the Ben & Jerry's in Ward Centre. To put you in a better mood, See is giving it away, from noon until 8 p.m. Tuesday. You can have a free single-scoop cone of Ben & Jerry's most popular flavors, including Cherry Garcia and Chunky Monkey. And you can have as many cones as you like, as long as you're willing to go back and stand in line again. See does ask that you bring a canned good or give a donation to the Hawaii Food Bank. "We don't require it," she says, "but we'd sure appreciate it." Jazz at the Cupola: For a decade, pianist Rich Crandall put on weekly jazz concerts in the Musician's Union's Studio Six. Studio Six was a funky old room with bad carpet and stained ceiling tiles. But Crandall charged only $10, drew great musicians and helped reignite the jazz scene here. Crandall ended his regular Studio Six concerts in February. This week he debuts a new series, Jazz at the Cupola, at the Honolulu Design Center, the first and third Thursday of each month. Concerts are the same $10, but, notes the pianist, the Cupola is a far more upscale setting. Still, he adds with a laugh, "Maybe jazz fans are more comfortable slumming." He'll be doing a Studio Six concert from time to time as well. » Murder they wrote; 'Hawaiian' novels, not!